Home > For People - SALE! > PAWSOME - SALE! Dogs are PAWSOME! Show your doggie love with our extra comfortable vintage t-shirt. You will love the fit, feel and durability. Tri-blend construction of polyester, cotton and rayon means a unique texture that drapes against your body for a slimming look, the soft and stretchy fabric will retain shape and elasticity. 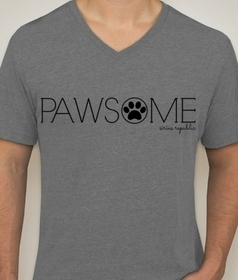 Grey v-neck shirt with black lettering. Unisex adult sizing. Machine wash and dry. Proudly made in the U.S.A.